Starring: Jeremy Renner, Gemma Arterton, Famke Janssen, Pihla Viitala, Derek Mears, Robin Atkins Downes, Ingrid Bolsø Berdal, Joanna Kulig, Thomas Mann, Peter Stormare, Rainer Bock, and more. 1) Acting - Total Thumbs Up: Jeremy Renner and Gemma Arterton are great as the famous siblings. I loved the little touches in visual cues or silent looks that spoke of the siblings close relationship and also their different personalities. Famke Janssen was delicious as the evil Muriel. 2) Special Effects - Total Thumbs Up: From the unique touch-ups on the witches, to the glowing of wands, to the great work on Edward, the special effects were great. Throw in some super cool weapons and colorful zapping spells and there's plenty to keep the eyes occupied. And wait till you see the candy cottage! The frosting on the roof even dripped. The title sequence where we're given a quick flash through of Hansel and Gretel's life with the moving paper cutouts was great. And like the original fairy tales from the Brothers Grimm, the sequence gets bloody. The rest of the film also had its share of bloody splatters. 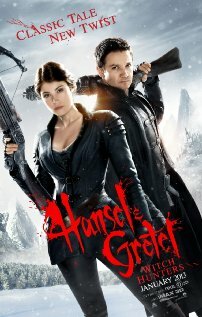 3) Plot/Story - Thumbs Up: "Hansel & Gretel: Witch Hunters" is a fairy tale about a fairy tale, so normal rules do not apply. The spin on the well known story was a lot of fun. But even better were the couple of unexpected story loops that got thrown in as well. I'd talk about them, but I don't want to spoil them for you. Several great one liners in the script! And since there were no rules, we get lots and lots of anachronistic but still very fun weapons. 4) Stunts - Total Thumbs Up: Lots and lots of hand to hand combat with lots and lots of fun weapons. All the fights were fast, well choreographed, with many little surprises. Several great strategies for dealing with witches on their brooms (which in this film, it looked like any kind of stick would pretty much do as one - some were even quite bizarre looking). A lot of trees had parts and pieces scraped, cracked, or blown up, making the 'gags' more amazing with all that wood shrapnel for the stunt people to avoid during filming. 5) Locations/Cinematography - Total Thumbs Up: Since the film dealt with witches, it seemed apt that several of the sweeping views over the forest and the town appeared to have been shot from the point of view of a witch riding her broom. As I mentioned earlier, the candy cottage was marvelous. The candy designs on the door was cool until you realize that the outer circle look like giant teeth, which then made it utterly creepy. The gloomy, rotted inside of the cottage made for a great contrast. The woods, the hidden ponds, and the waterfalls were perfect. Conclusion: "Hansel & Gretel: Witch Hunters" is a great romp if you're looking for some fun fights, an unexpectedly decent story, and super cool weaponry. Like the original Grimm fairy tales, the film is graphically bloody in places, so I wouldn't recommend it for younger viewers. If you can afford it, definitely go see it in IMAX 3D.